Stephen Curry's wife Ayesha trolled Cavaliers fans after Game 4. Riley Curry has been the star of NBA playoffs, but even stars need to rest sometimes. Ayesha Curry, the wife of Warriors point guard Stephen Curry, posted a photo of a sleeping Riley after Golden State evened the series with a 103–82 road win in Game 4, which revealed that the 3-year-old slept through the entire first half of both games in Cleveland. This apparently does not happen in Oakland, as according to Ayesha the Oracle Arena crowds are so loud they keep young Riley awake. It's some good-natured trolling from the MVP's wife, and we even got an adorable Riley photo out of it. Nothing like #roaracle arena!!! Riley slept through the entire first half both nights here in Cleveland! Can't wait to get back home to the bay!!! #2moretogo We bring the noise in the bay. This isn't the first time that Oracle Arena's noise level has received a shout out. In April, Pelicans coach Monty Williams suggested the arena crowds there are so loud it might be illegal. 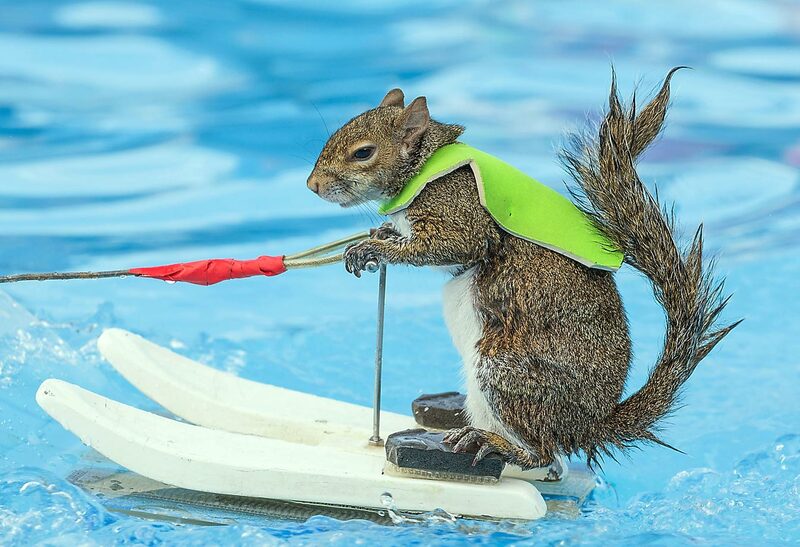 Twiggy the Water-Skiing Squirrel gives fans a thrill during X Games Austin on June 5 at Circuit of The Americas in Texas. 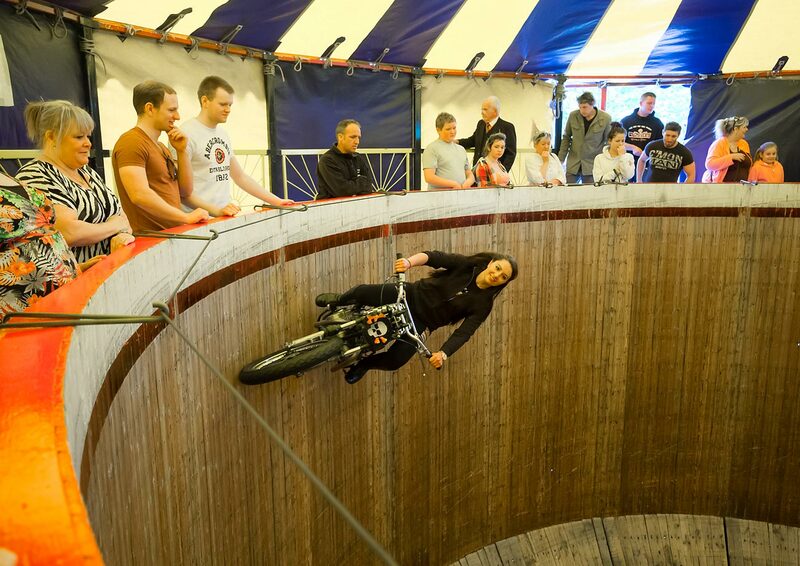 The Wall of Death is ridden by a stunt rider on June 4 at this year's Royal Cornwall Show in Wadebridge, England. 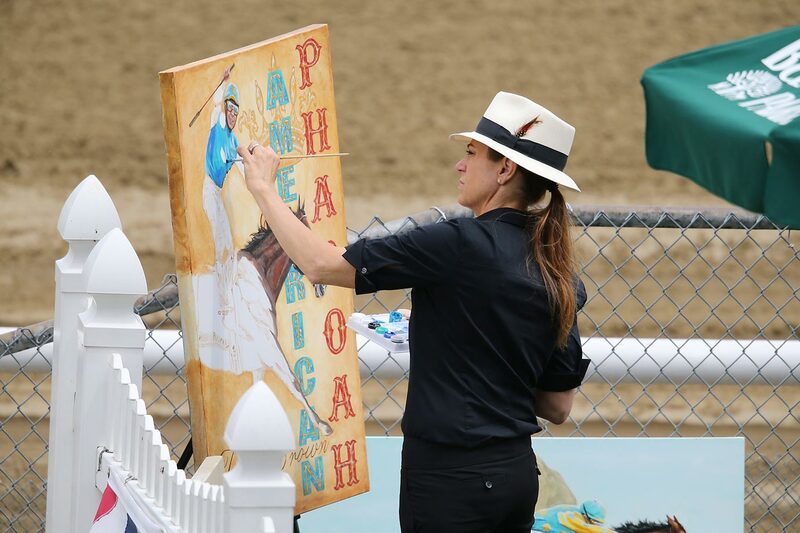 American Pharoah is captured through the strokes of an oil painter just before his historic run on June 6 at the Belmont Stakes. 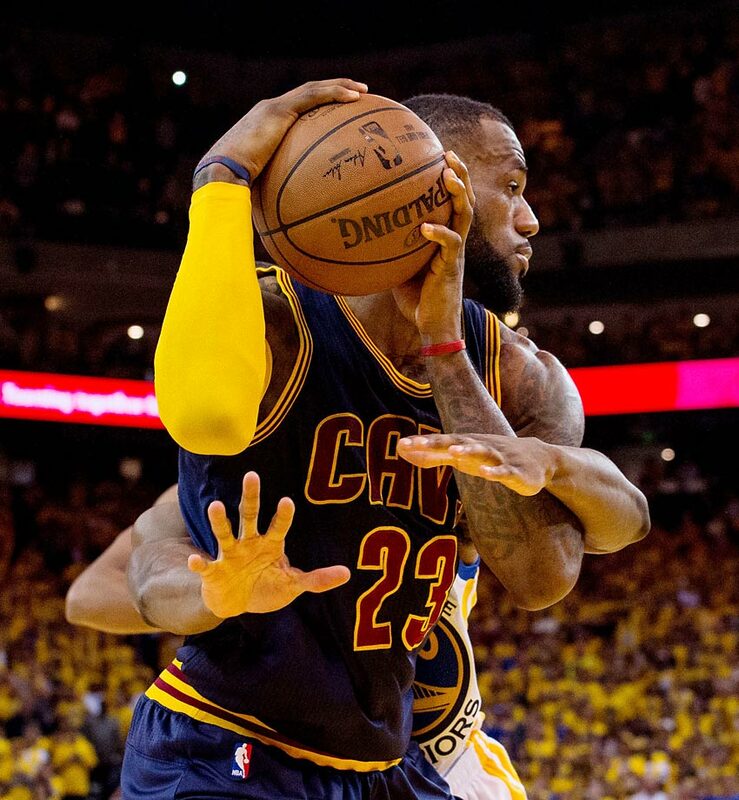 LeBron James is swarmed by a defender during Game 2 of the NBA Finals at Oracle Arena on June 7. 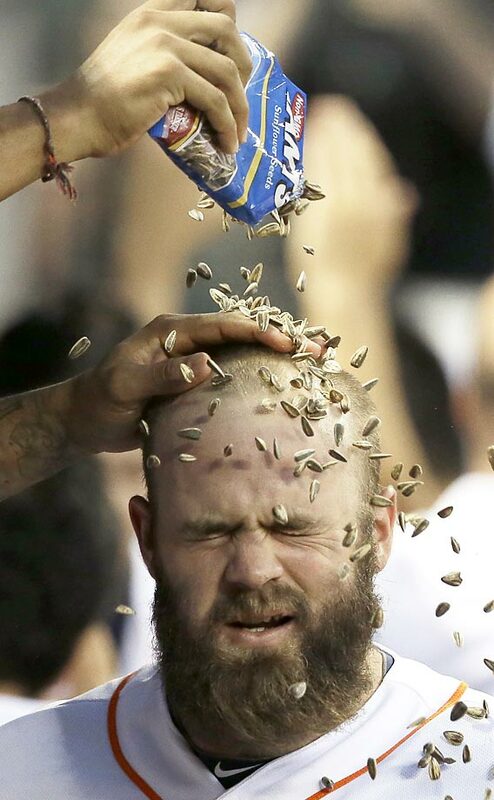 Evan Gattis of the Houston Astros is rewarded with a sunflower-seed shower for hitting a three-run home run against the Baltimore Orioles on June 2. 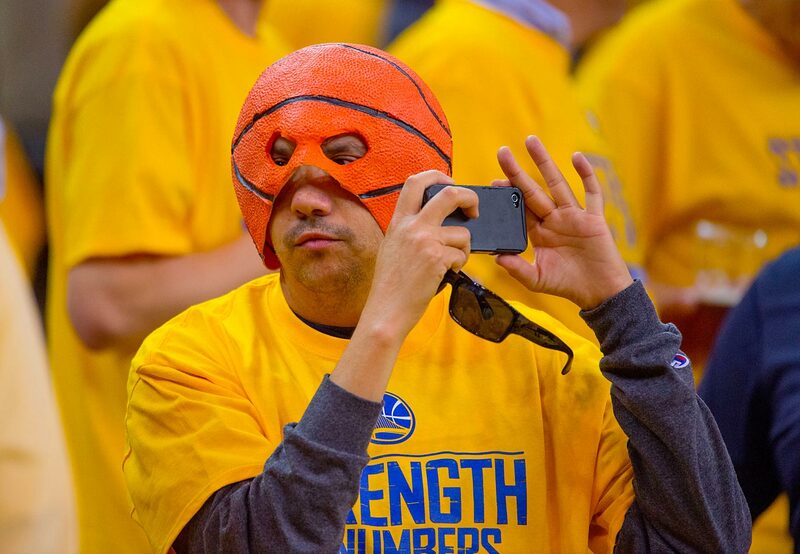 A Golden State Warriors fan dons a creative mask during Game 2 of the NBA Finals at Oracle Arena on June 7. 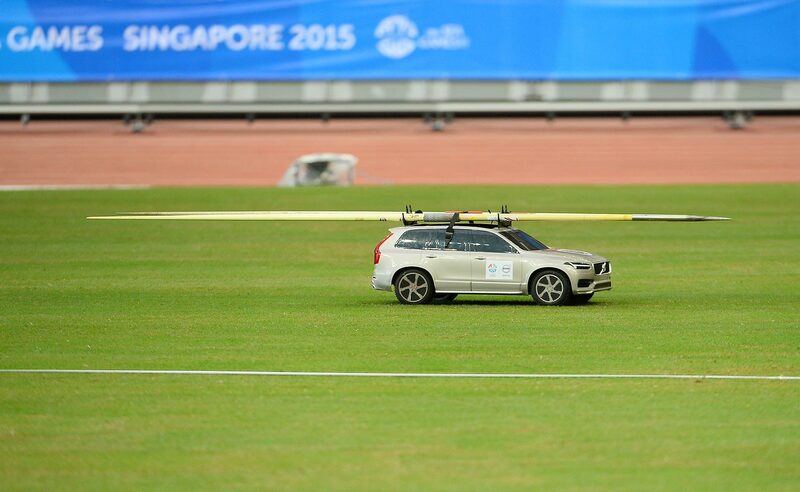 A remote-controlled car transports a pair of javelins on June 10 at the Southeast Asian Games in Singapore. 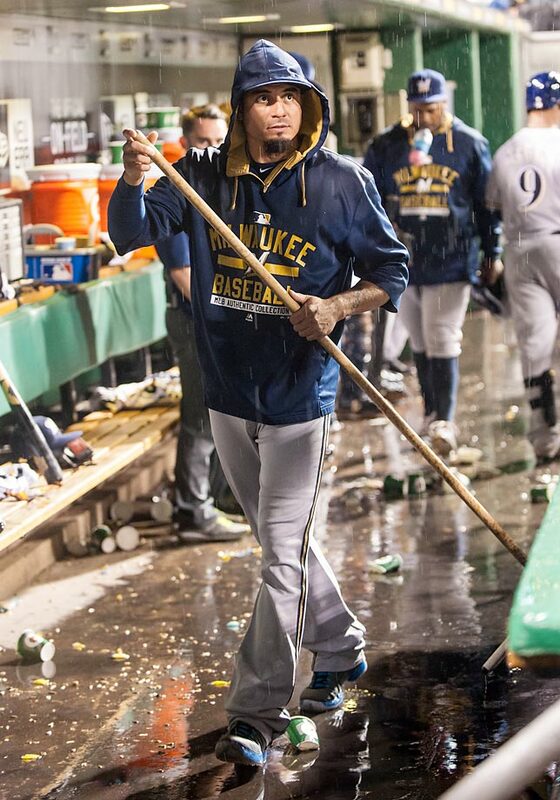 Matt Garza of the Milwaukee Brewers (center) does some in-game mopping during his team's June 8 rainy matchup against the Pittsburgh Pirates in Pittsburgh. 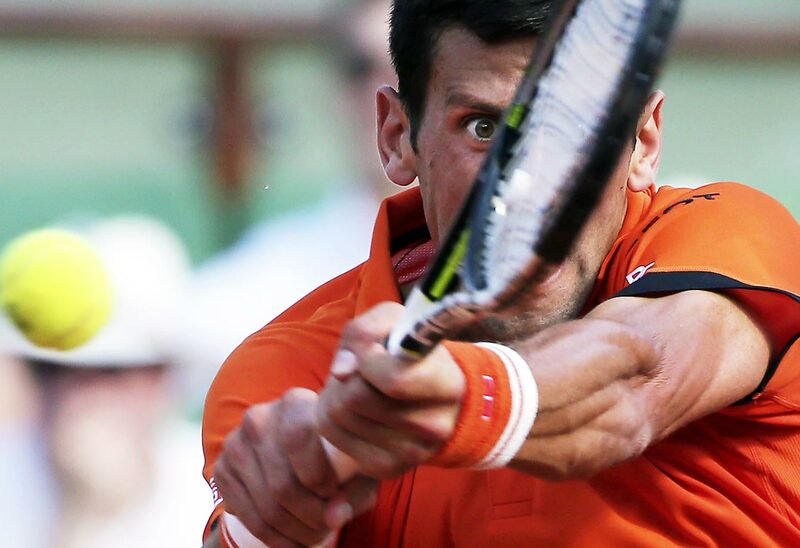 Novak Djokovic makes a feverish return to Andy Murray in the French Open semifinal match at the Roland Garros stadium in Paris on June 5. 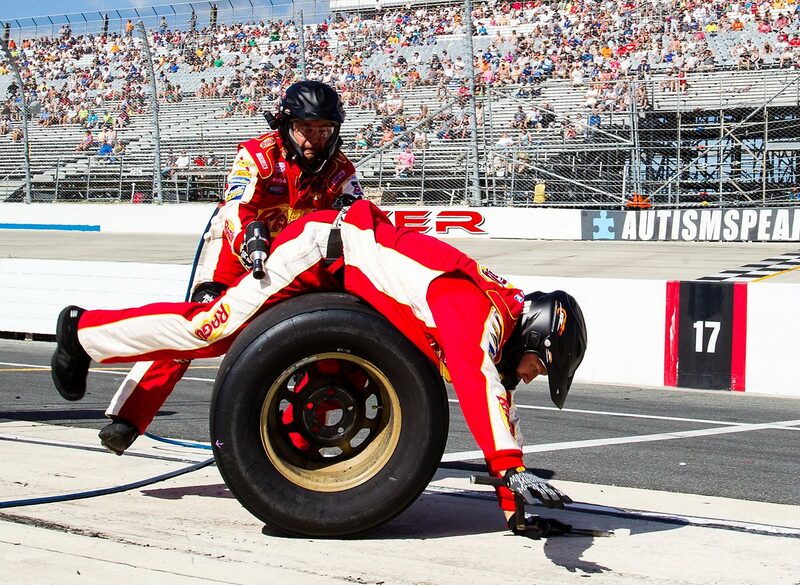 The Buckle Up 200 was host to a pit stop gone awry for the rear tire team of the #88 Ragu Chevrolet at the Dover International Speedway on May 30. 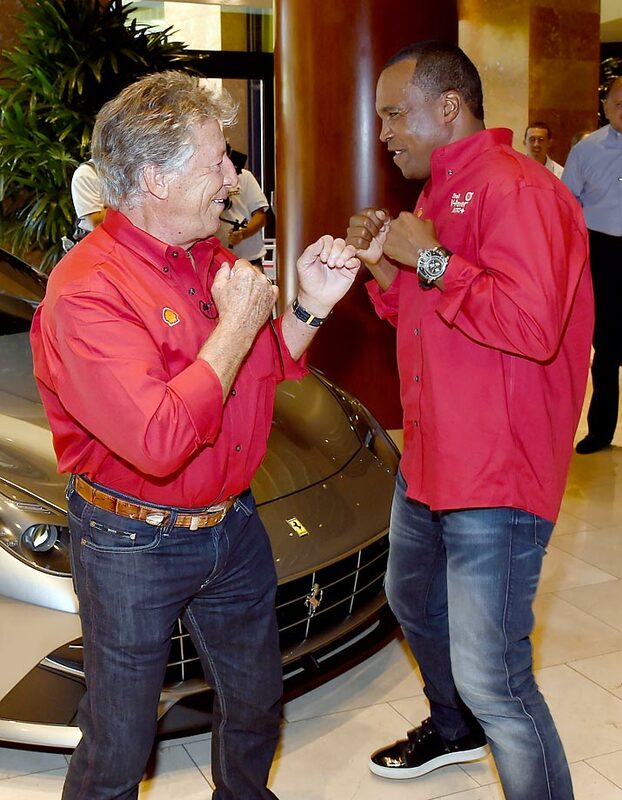 Sugar Ray Leonard (right) and sparring partner Mario Andretti (left) had some fun at the Penske Wynn Ferrari Showroom at Wynn Las Vegas on June 8. 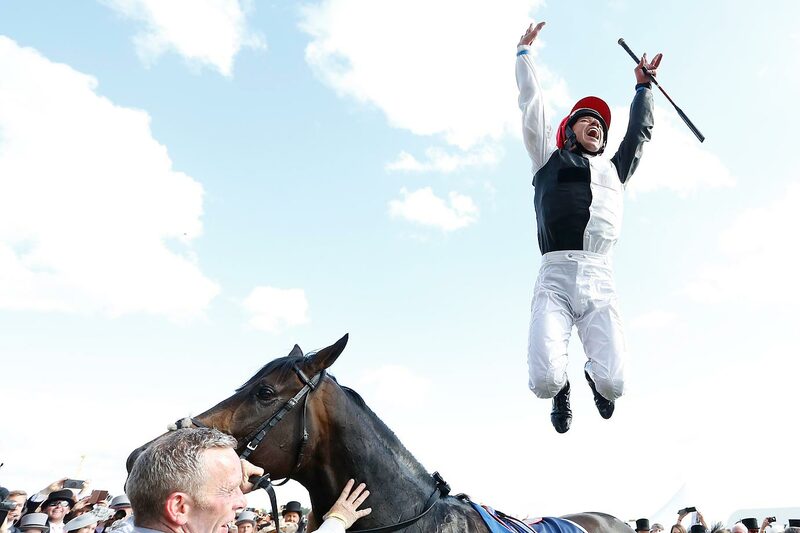 Jockey Frankie Dettori jumps for joy from Golden Horn after his victory at The Investec Derby in Epsom, England on June 6. 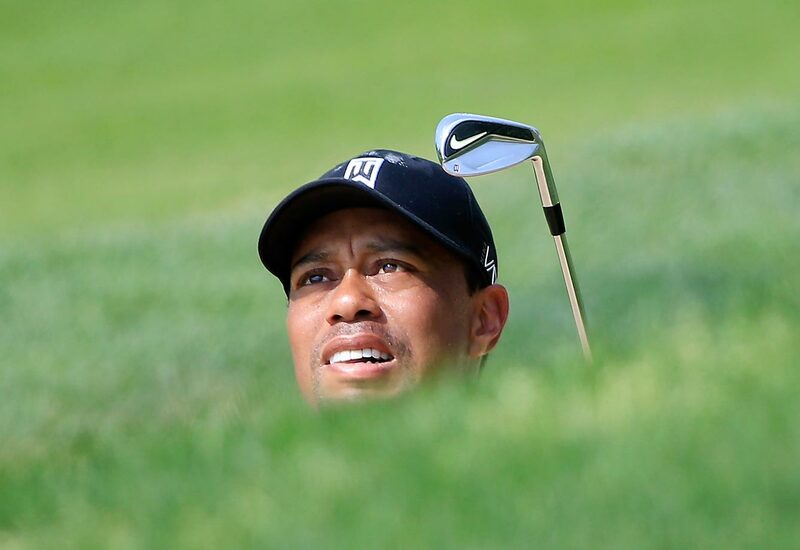 Tiger Woods stares down his shot on the 17th hole during the last round of The Memorial Tournament in Dublin, Ohio, on June 7. 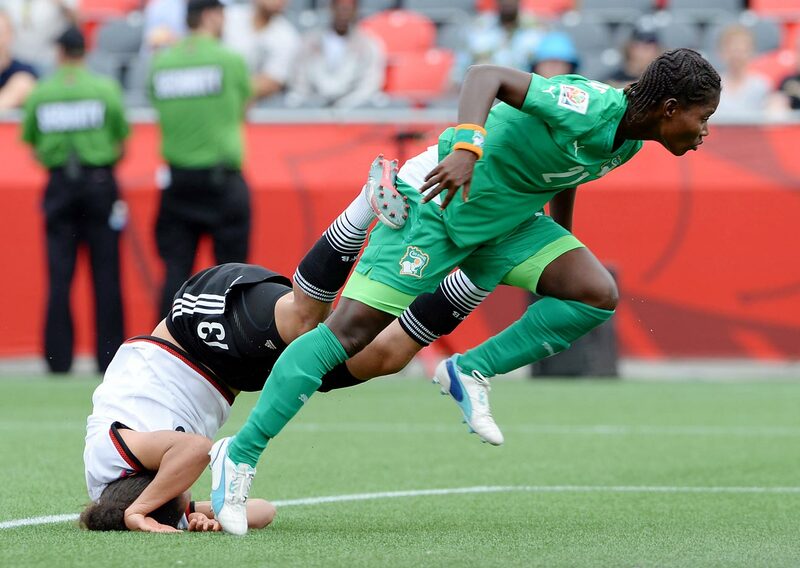 A collision with Ivory Coast's Sophie Aguie sends Germany's Celia Sasic to the turf during the FIFA Women's World Cup in Ottawa, Ontario on June 7. 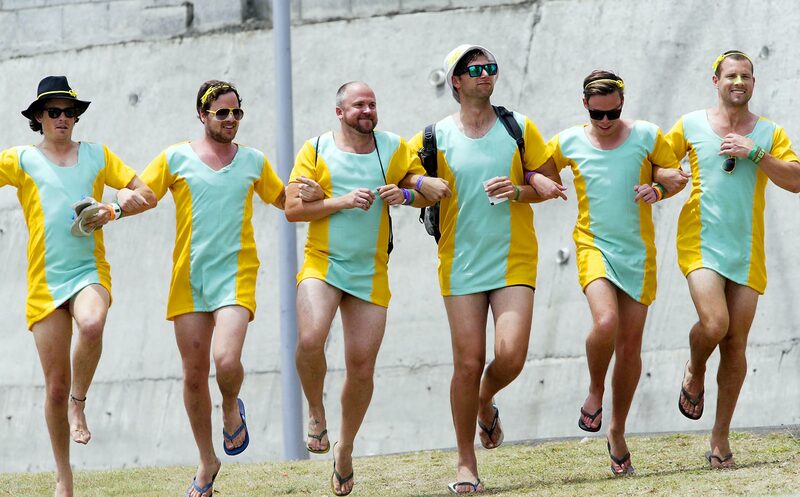 The first cricket Test match brought out some happy Australian fans, who danced arm in arm while watching their team and West Indies go to battle on June 5 in Roseau, Dominica. 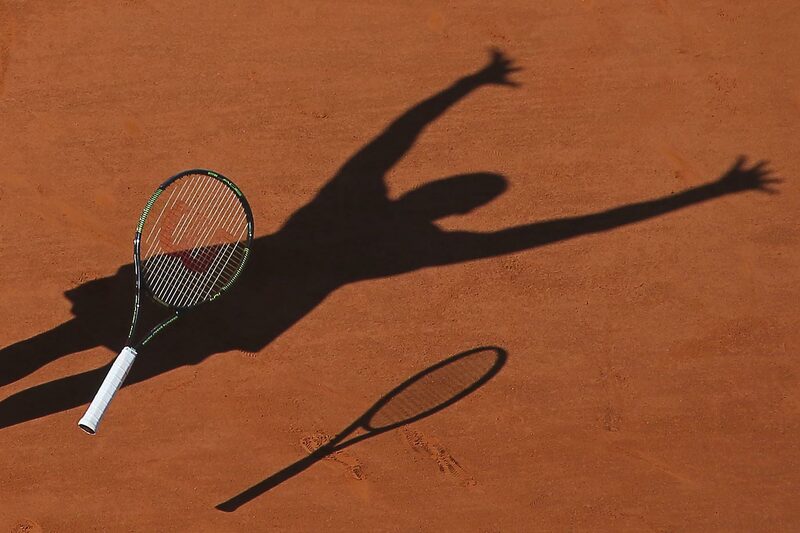 Seen through a shadow on the clay at the Roland Garros stadium in Paris is a victorious Serena Williams, who dropped her racket in celebration after beating Lucie Safarova in three sets, 6-3, 6-7, 6-2, to win the French Open on June 6. 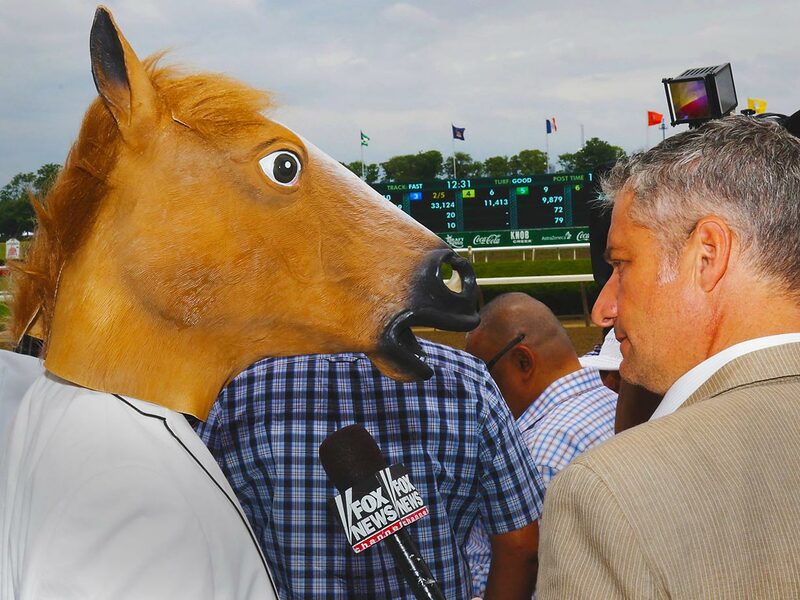 Fox News interviews one excited fan at the Belmont Stakes on June 6. 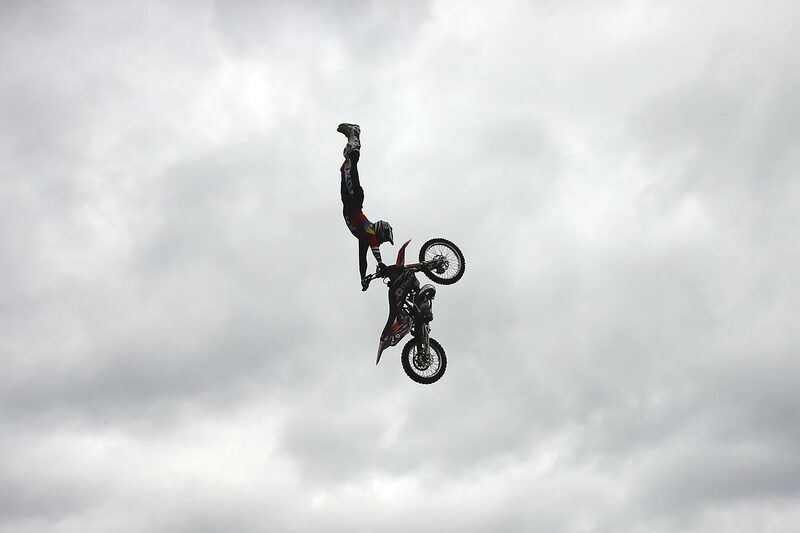 Motorcross rider Steve Sommerfeld executes a jump at the Night of the Jumps Freestyle MX World Championship event in London, England on June 2. 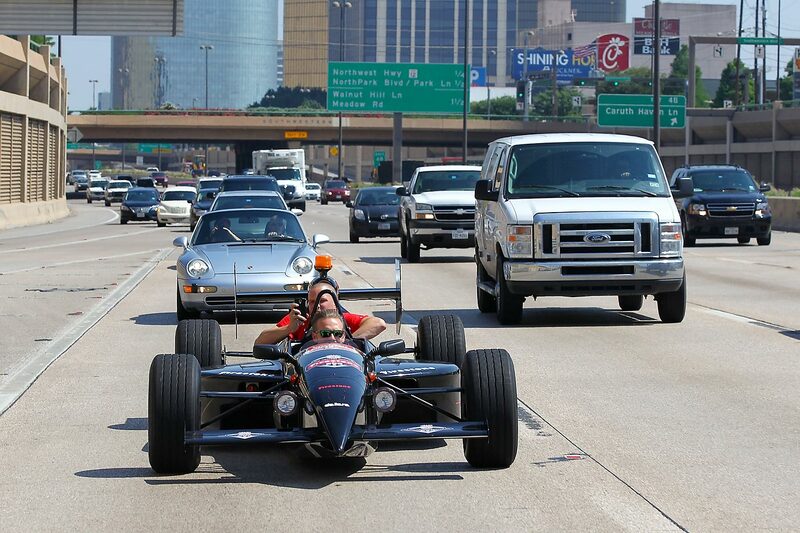 Verizon IndyCar Series driver Ed Carpenter drives an INDYCAR on a highway in the Dallas/Fort Worth, Texas, area on June 3 with Jeff Cavanaugh of GBAG Nation and co-host of KRLD-105.3 The Fan. 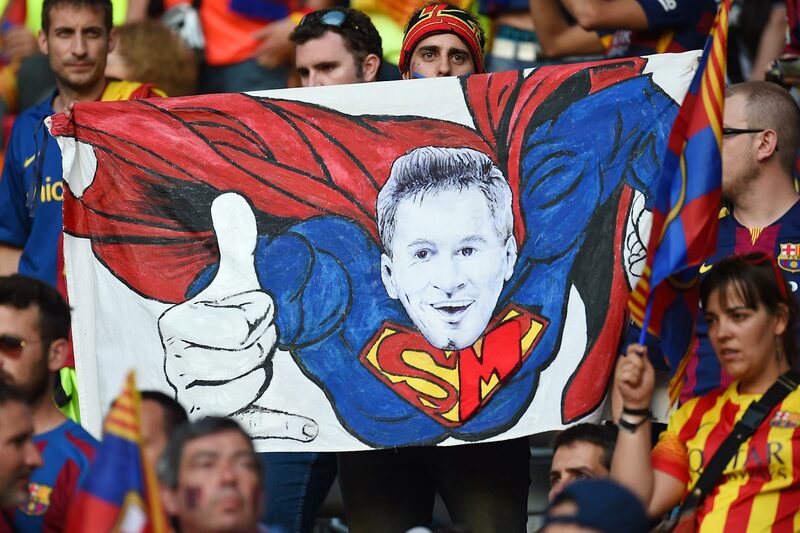 FC Barcelona fans display a poster of Lionel Messi as Superman before the UEFA Champions League Final between Juventus and FC Barcelona in Berlin on June 6. 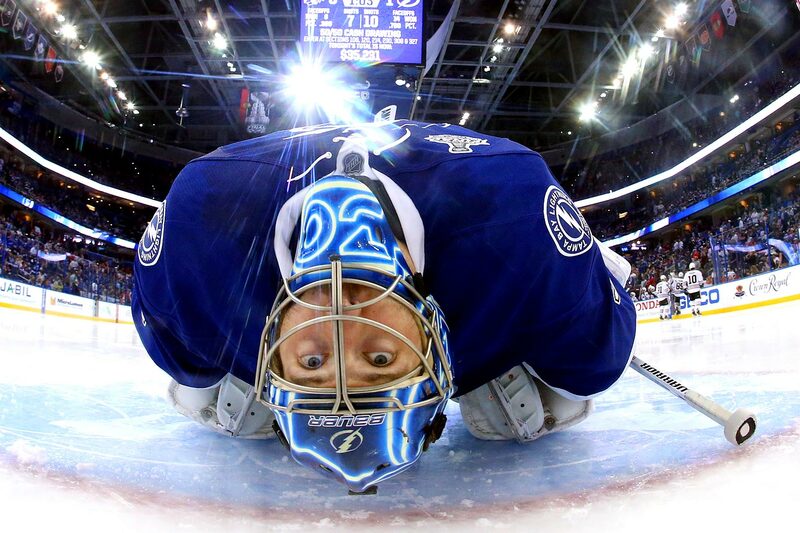 Tampa Bay Lightning goalie Ben Bishop stretches between periods during Game 1 of the NHL Finals on June 3 at Amalie Arena in Tampa. 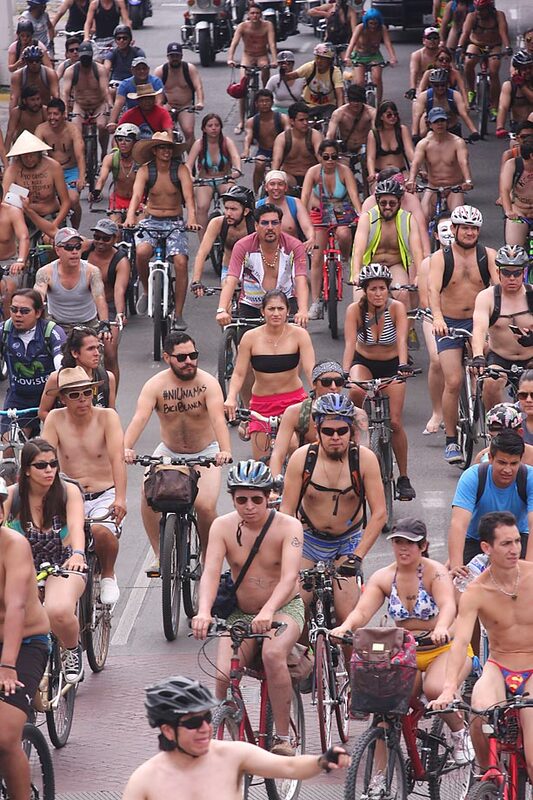 A slew of naked bikers rides through Guadalajara, Mexico, on June 6 in an effort to protest against gas emissions and promote alternative forms of transportation. 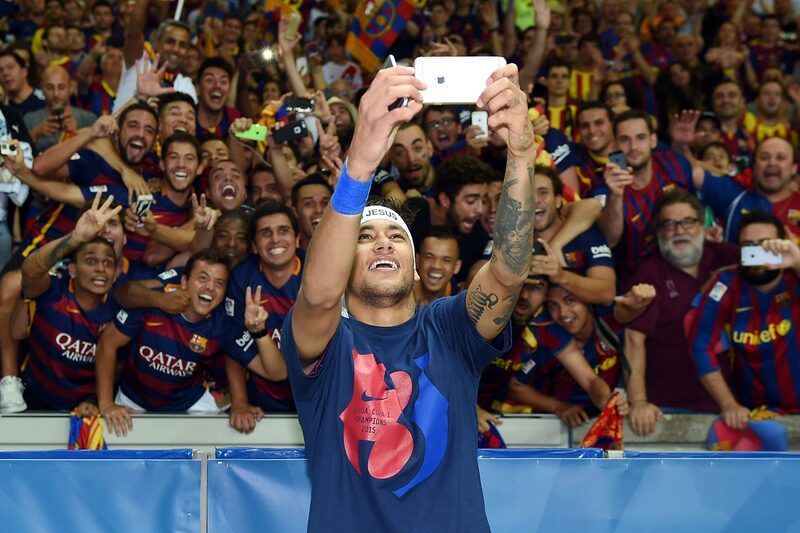 Neymar da Silva Santos Jr. of Barcelona poses for a selfie with fans following his team's victory over Juventus in the UEFA Champions League Final on June 6 in Berlin. Juan Quintero of Columbia is consoled by teammate Santos Borre after their team's loss to the USA in the FIFA U20 World Cup Round of 16 match on June 10 in New Zealand. 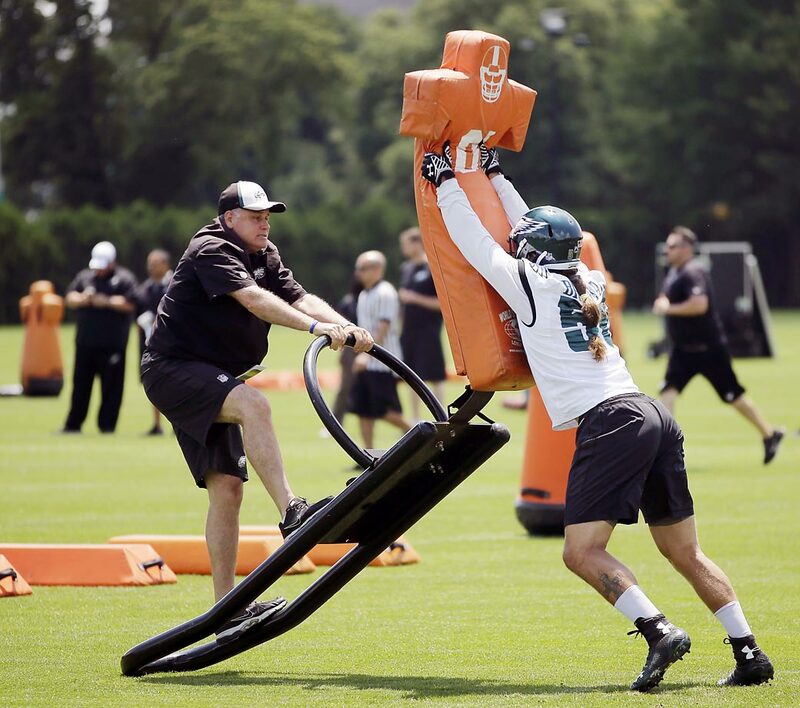 Bryan Braman (right) of the Philadelphia Eagles participates in drills at organized team activities on June 9 in Philadelphia. 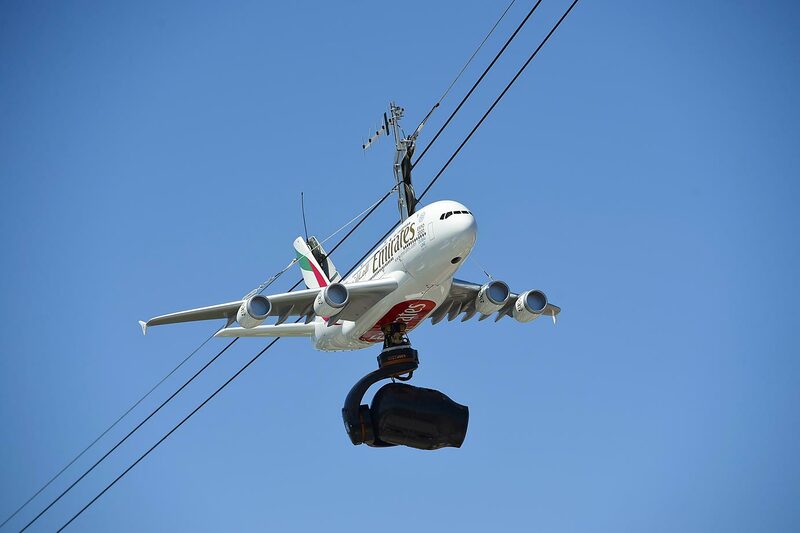 A remote camera hangs from a faux airplane at the French Open on June 6. 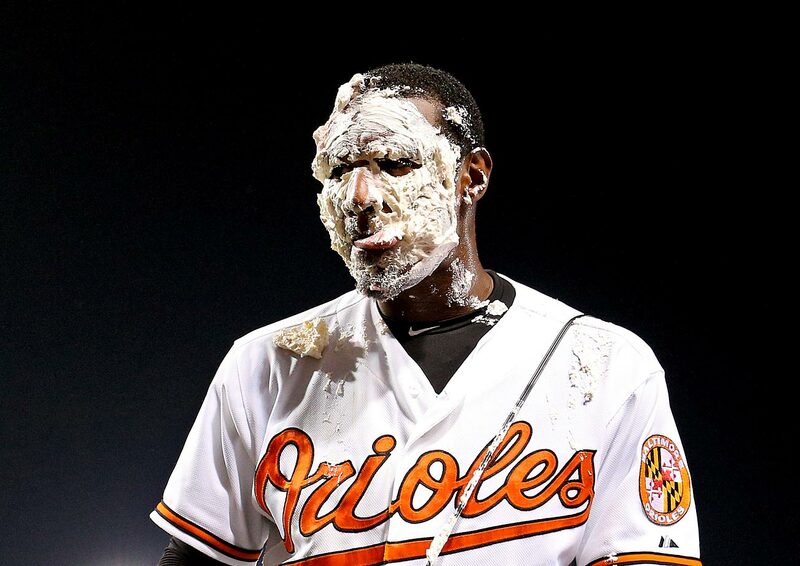 Adam Jones of the Baltimore Orioles gets a victory pie to the face from teammate Manny Machado (not pictured) after playing hero in his team's win over the Boston Red Sox on June 10. 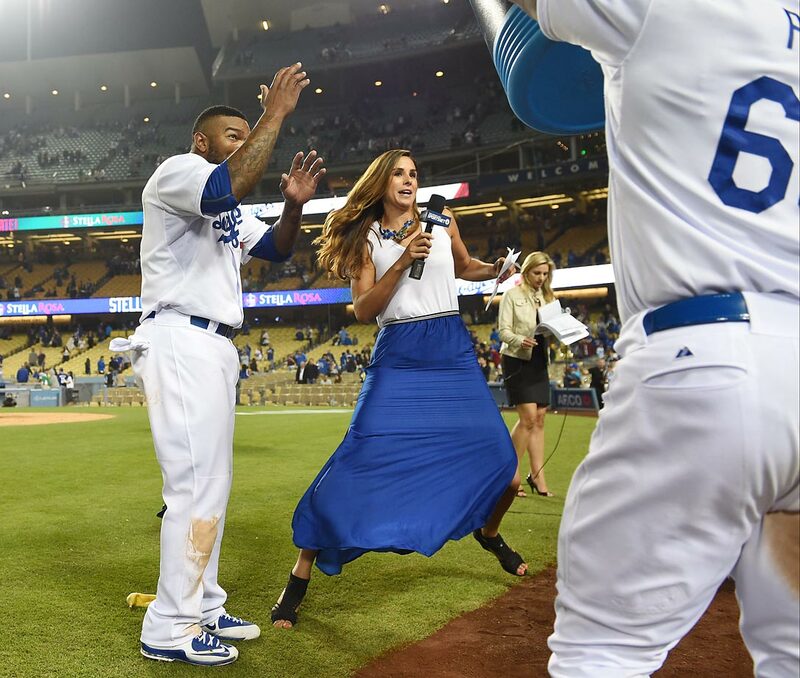 Howie Kendrick of the Los Angeles Dodgers braces for the impact of a Powerade shower. Kendrick knocked in the game's decisive run in the bottom of the 9th inning in L.A.'s win against the Arizona Diamondbacks at Dodger Stadium on June 10. 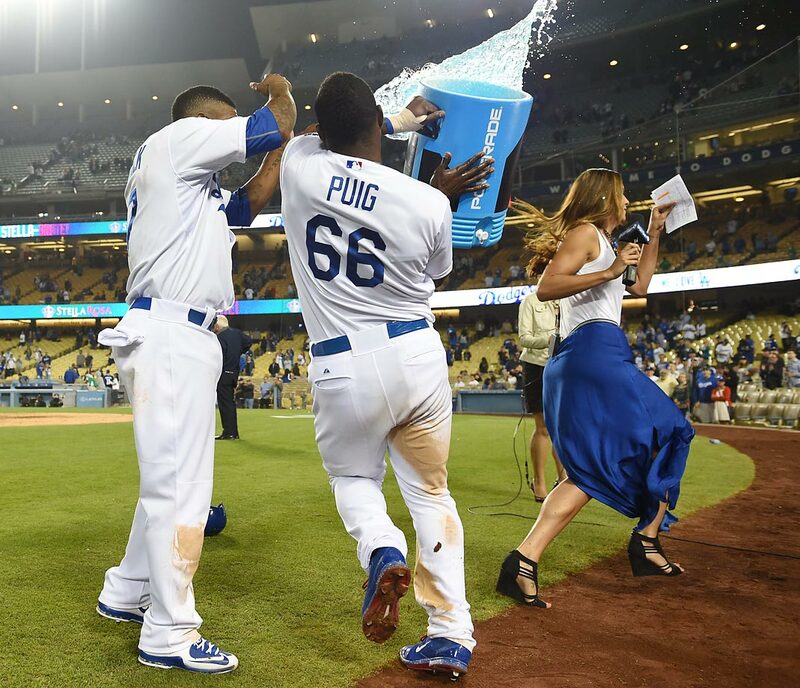 Yasiel Puig makes his way over to teammate Howie Kendrick to bestow a Powerade shower upon him following a Dodgers walk-off win on June 10. 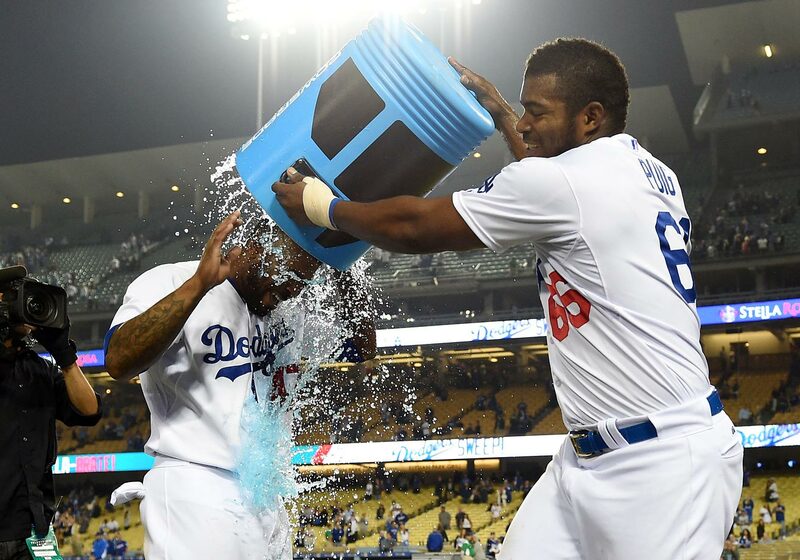 Yasiel Puig congratulates teammate Howie Kendrick with a Powerade shower after his game-winning base hit on June 10. 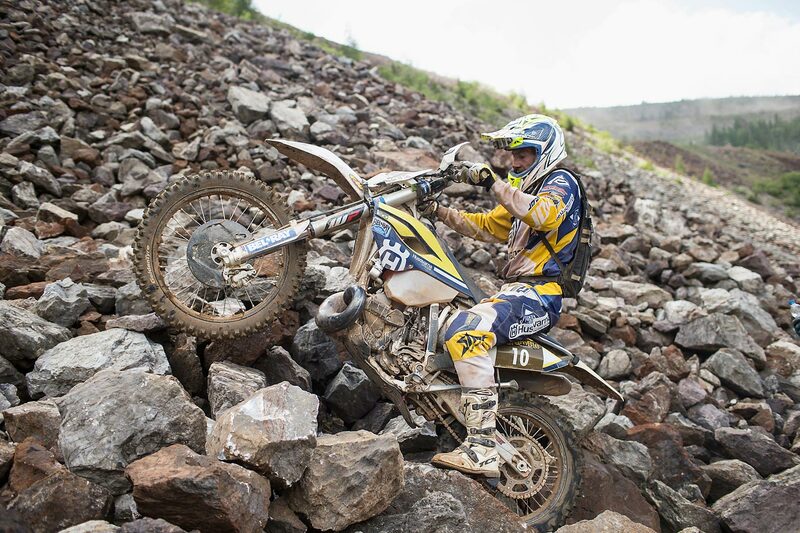 Great Britain's Graham Jarvis makes some noise at the Red Bull Hare Scramble in Austria on June 7. 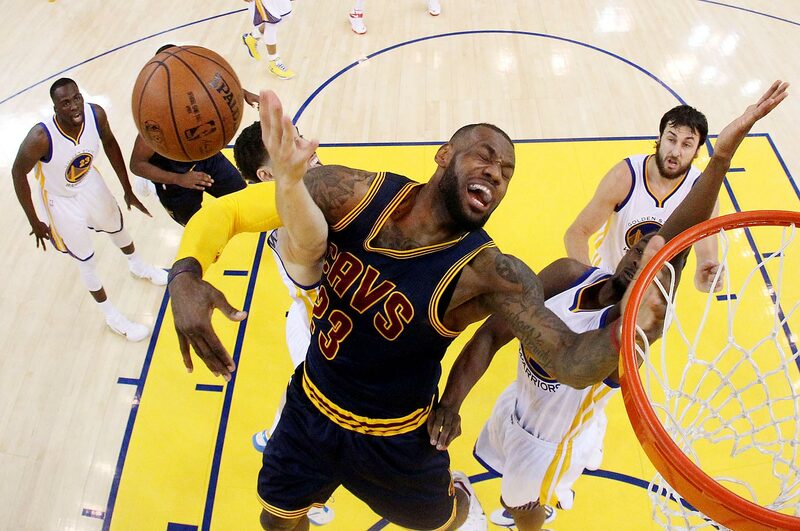 LeBron James gets hacked by Klay Thompson of the Golden State Warriors as he goes up for a shot in Game 1 of the NBA Finals at Oracle Arena on June 4. 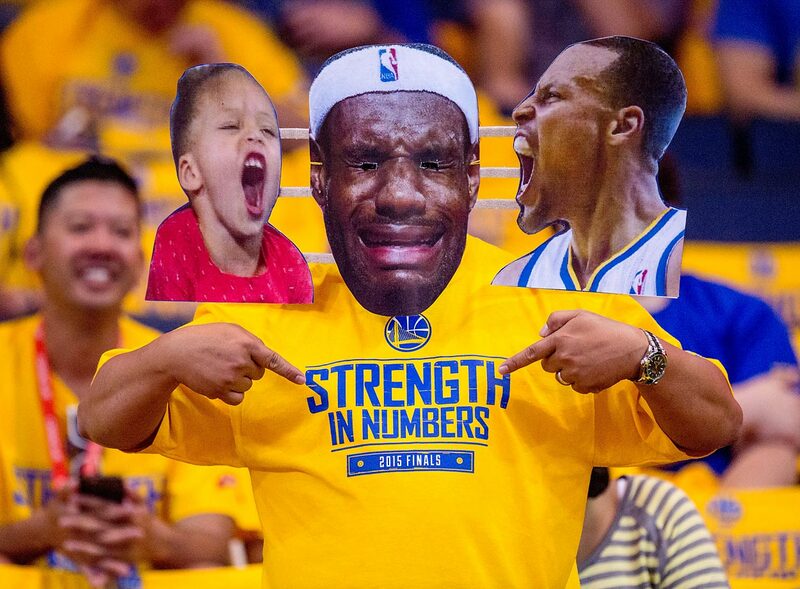 One Golden State Warriors fan captures a moment before Game 1 of the 2015 NBA Finals on June 4. 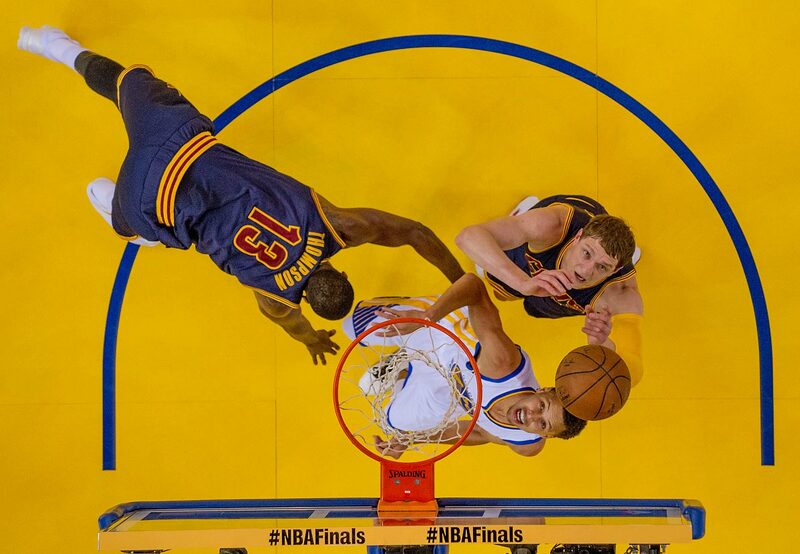 Golden State Warriors guard Stephen Curry and Cleveland Cavaliers center Timofey Mozgov fight for a rebound during Game 2 of the NBA Finals on June 7. A Golden State Warriors dancer stretches before Game 2 of the NBA Finals on June 7. 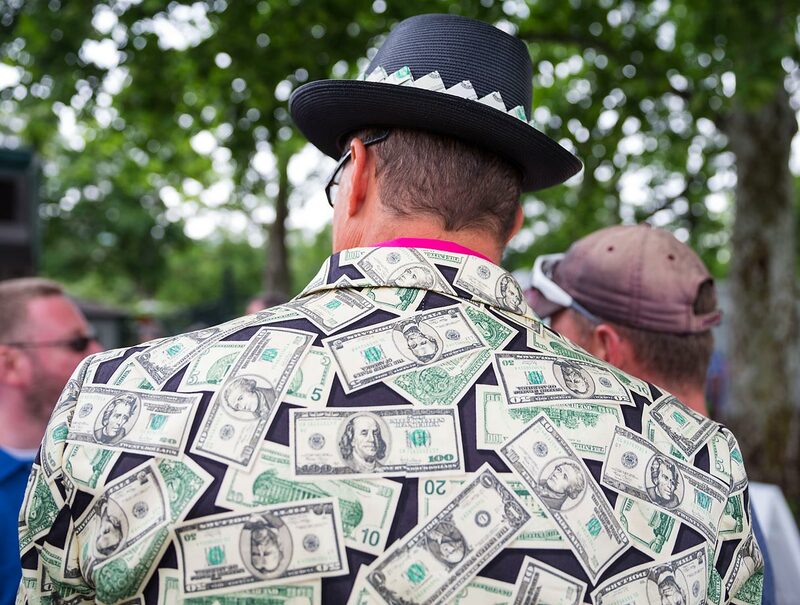 A fan comes to the Belmont Stakes decked out in dollar bills on June 6 in Elmont, N.Y. 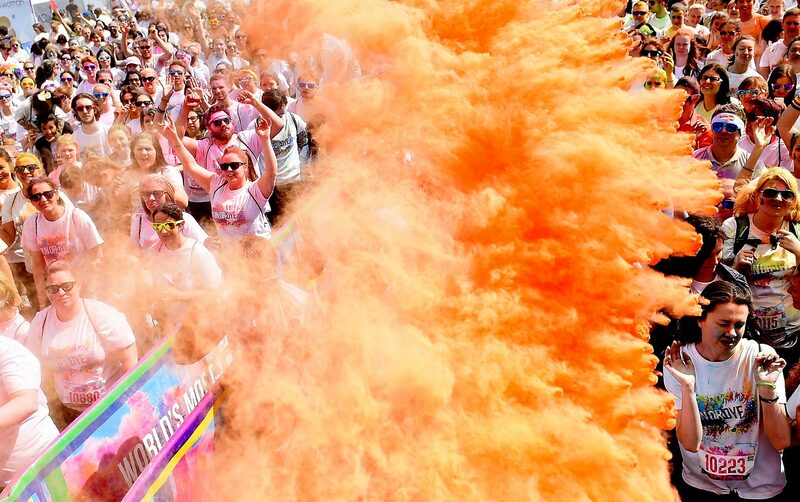 Participants in the Run or Dye race in Liverpool, England, get covered with powered paint on June 6.